We're witnessing the most incredible feeding session. Minutes ago, Pappa flew in with a sizeable meal for his family. 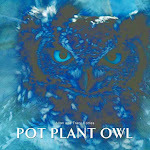 Pot Plant Owl started shredding pieces of food for her chicks. We're now watching what can only be described as a 'feeding frenzy'. Webcam viewers are seeing the tiny little white heads popping up, and grabbing the pieces of shredded meat hungrily. It appears the chicks are ravenous for they are coming back for more and more and more. How their minute bodies will handle all the food going in, is anyone's guess. From past experience watching PPO chicks, tomorrow I fully expect to see two chicks double their current size. Pappa's in with more food - a tasty King Cricket which would normally be devoured in seconds. He stands patiently at the nest, offering the meal to his family, but there are no takers. He's just flown away with the King Cricke, probably to eat it himself somewhere in peace. The feeding session was wonderful to see, those two little bobbleheads popping up for more and more! Pappa's patience holding the king cricket and waiting for PPO to notice him and take it was so cute! And when she just looked at him as if to say "What... a lousy king king cricket? That should have been the hors d'oeuvre!" And then seeing him fly away with it was so cute! Love this, love this, love this!!! Thank you again so much!